Sunday was my nephew Deuce's 1st birthday party. I can't believe he is already 1 and that Noah is closely approaching the big 1 himself. So picture this, we are all around the table signing Deuce "Happy Birthday". My sister lets Deuce touch a bit of the cake and she then started slicing up the cake. She places a plate in front of Deuce for him to dig in...and what happens? OH my piggy son decides to take that piece of cake and eat it himself!!! It was too funny! Clint got a great picture of it! 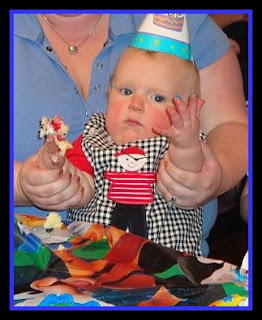 Maybe at Noah's party Deuce will steal a piece of his cake! However, I think Deuce made up for it a bit when he stole Noah's sippy cup! It was all really cute!